Westminster School in Adelaide has begun the school year by focusing on the future of learning. The school is undertaking a refresh and their learning spaces and technology are being upgraded to meet the future needs of their students. A whole day of professional learning was planned by the Director of Learning to inspire the teachers and challenge them for the year ahead. The school has undertaken strategic planning which focused on the needs of students as they move into a 21st-century workforce where developing a broad range of skills largely around the capacity of students to collaborate, communicate, think critically and be creative is a necessity. As a staff working together, they have come together as a learning community to collaborate about their practices and be creative in the learning activities they provide to their students. The SMART Team provided a keynote on Future Focused Learning and demonstrated how the SMART Learning Suite enables these skills in the classroom. They then worked specifically with the Maths Team who were keen to understand the capacity of the SMART Learning Suite to improve Maths instruction and engage students. Using the class. lab “shout out” function the Maths staff were asked in their experience what were the most difficult concepts in Maths for students to understand. The staff using this tool quickly identified a range of concepts such as: fractions, Division, reading graphs, probability, using the calculator, the relationship between a graph and an equation, algebra, and probability. 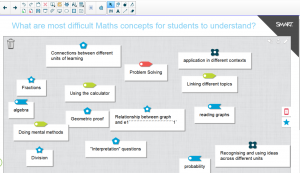 The training session was then tailored to demonstrate a range of specific Maths tools included in the SMART Learning Suite, for instance, GeoGebra, graphing, response and gamification tools. 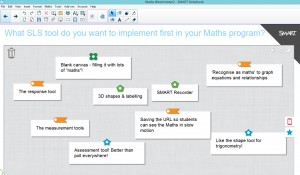 After the training session, the Maths team were asked which of the SLS tools which had been demonstrated to them were they going to implement in their Maths programs. Staff members were keen to use the response tools which are accessed seamlessly within the software as well as all the measurement and graphing tools. They also understood the need for each of them to trial one of the activities and then to share their practices and how they used it with the team. This approach will mean that the change being implemented is sustained and that best practices can be established amongst the whole faculty. This process will promote collaboration and make the challenges of undertaking a new technology manageable. We look forward to supporting Westminster on their journey to embrace SMART Technologies and model 21st century practices with their students.